We are offering Western 6 Hole Guitar Bridge. Our company specializes in offering quality Guitar Adjustable Bridges, which meets the variegated requirements of our clientele. This has a finishing of spruce and satin, both back and side of the maple. We ensure that these are manufactured employing the quality raw materials are in accordance with the international standards. 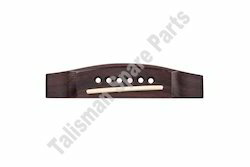 Our Guitar bridges are made from high quality Indian Ebony wood & Rose wood and are durable in quality. Avail from us, our exquisite collection of guitar bridges that are used as guitar parts. These musical accessories can be availed in different sizes so as to suit the varied requirements of our clients. These guitar bridges that are guitar parts are well polished and finished to give them a smooth look and finish.